June 2, 2015 – NASA’s Cassini spacecraft has returned images from its final close approach to Saturn’s strange moon Hyperion, upholding the moon’s reputation as one of the most bizarre objects in the solar system. 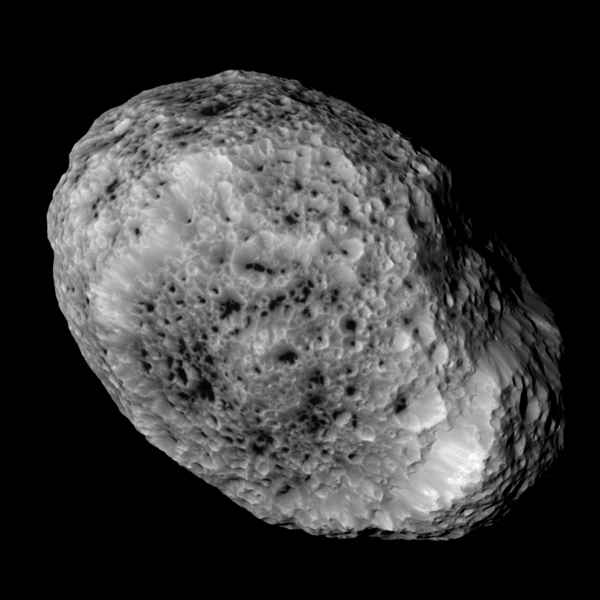 The views show Hyperion’s deeply impact-scarred surface, with many craters displaying dark material on their floors. During this flyby, Cassini passed Hyperion at a distance of about 21,000 miles (34,000 kilometers) at closest approach. Cassini’s closest-ever Hyperion flyby took place on September 26, 2005, at a distance of 314 miles (505 kilometers). Cassini will make several more close flybys of Saturn’s moons this year before departing the planet’s equatorial plane to begin a year-long setup of the mission’s daring final act. For its grand finale, set for 2017, Cassini will repeatedly dive through the space between Saturn and its rings. The Cassini-Huygens mission is a cooperative project of NASA, ESA (European Space Agency) and the Italian Space Agency. NASA’s Jet Propulsion Laboratory in Pasadena, California, manages the mission for the agency’s Science Mission Directorate in Washington. The Cassini imaging operations center is based at the Space Science Institute in Boulder, Colorado. The California Institute of Technology in Pasadena manages JPL for NASA.